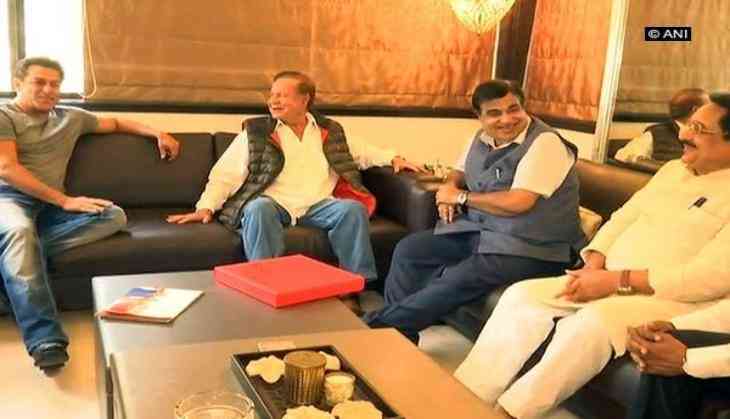 Union Minister for Road Transport & Highways, Shipping and Water Resources, River Development & Ganga Rejuvenation Nitin Gadkari met former Indian film actor and screenwriter Salim Khan as the part of the 'Sampark for Samarthan' initiative. Bollywood actor Salman Khan was also present. On May 29, Bharatiya Janata Party (BJP) President Amit Shah started 'Sampark for Samarthan' to highlight the achievements of the Prime Minister Narendra Modi-led government in the last four years. In the first leg of the initiative, Shah met former Army chief General Dalbir Singh at his residence in Gurugram. He has also met Bollywood actor Madhuri Dixit-Nene, industrialist Ratan Tata and Shiv Sena Chief Uddhav Thackeray as the part of the initiative. Meanwhile, Gadkari will meet Yes Bank CEO Rana Kapoor and actor Nana Patekar later in the day. While Shah aims to reach out to 50 people personally with details of initiatives and achievements of the government, each BJP karyakarta is expected to contact at least 10 people to make them aware of the achievements.